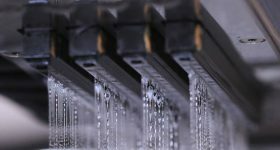 Materialise NV (NASDAQ:MLTS) stock rose this morning as the company revealed their latest financial results, and hinted at some exciting news. Joining founder and CEO Fried Vancraean on a call with investors were Executive Chairman Peter Leys and Johan Albrecht, CFO. 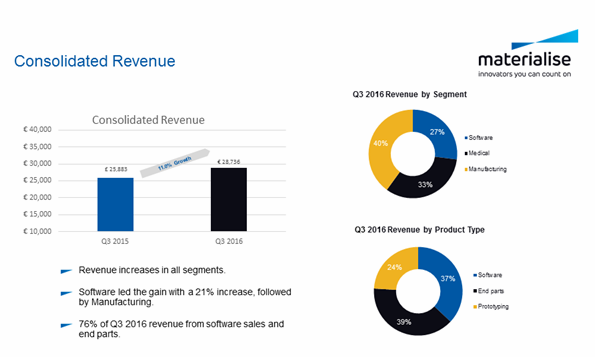 Materialise reported total revenue of $32m for the most recent three month period, an increase on the comparative figure of $28.38m (EUR 25.9m) for 2015. 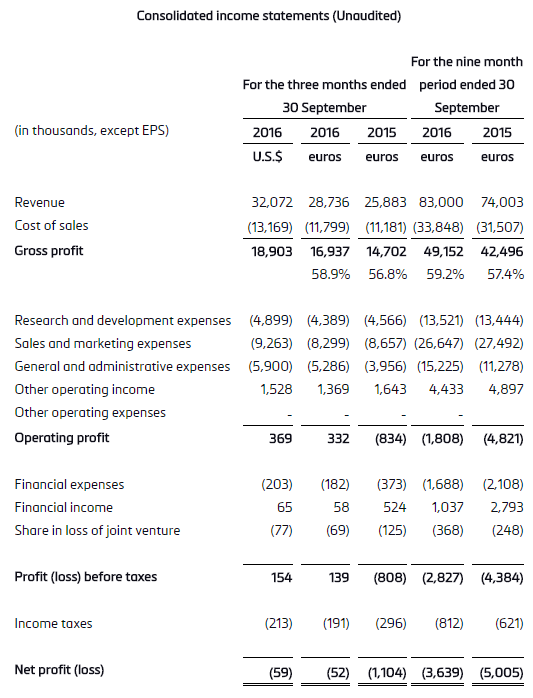 Gross profit for the most recent quarter was $18.9m, up from $16.12m (EUR 14.7m) and operating profit was $369k, a substantial improvement on the loss of $914.3k (EUR 834 thousand) for the same period in 2015. 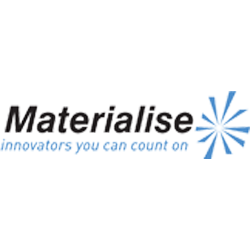 Materialise categorise revenue across three segments, Software, Medical and Manufacturing. Of these segments Software contributes the largest portion to earnings before interest, taxes, depreciation, and amortization (EBITDA) with 36.9% (Q3’15 34.2%) of the total. Revenue from the Manufacturing segment doubled during the quarter, reaching 14.9% of total EBITDA versus 7.6% for the same period last year. 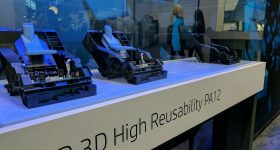 CEO Vancraean drew attention to the September announcement of Materialise’s backbone technology strategy, using the launch of Yunika as a case study. This platform is a sophisticated digital end-to-to supply chain strategy for the optical market. 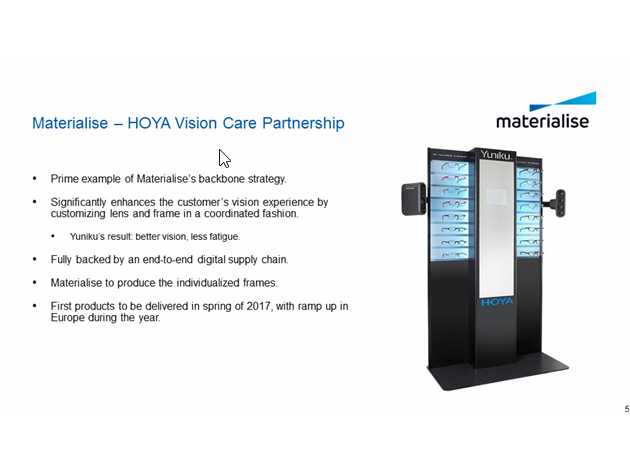 Working with Materialise, opticians will be able to offer lens and frames customized for “better vision and less fatigue” the first products will be available in Spring 2017. This backbone will be showcased at Formnext in Frankfurt next week. 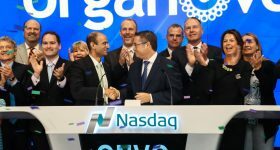 Vancraean highlighted that opticians frequently hold large stocks of unsold frames due to the vagaries of fashion and the Yuniku platform can reduce need to hold stock. 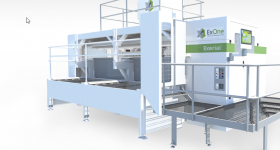 To support this new revenue stream Materialise have invested in a “new laser sintering plant in Poland,” this expansion adds to existing plant in Belgium. During the call the company confirmed they have a total of 148 printers and are working with partners Concept Laser, Arcam and HP. When questioned by one of the analysts on the call about new developments with HP and their MultiJet Fusion 3D printers Vancraean deflected the question and saying “[our] biggest partner is HP, they are definitely moving forward but I will leave it to them to make the announcement.” Such an announcement would make sense in the context of next week’s Formnext event where HP will demonstrate an operational version of the MultiJet Fusion system. 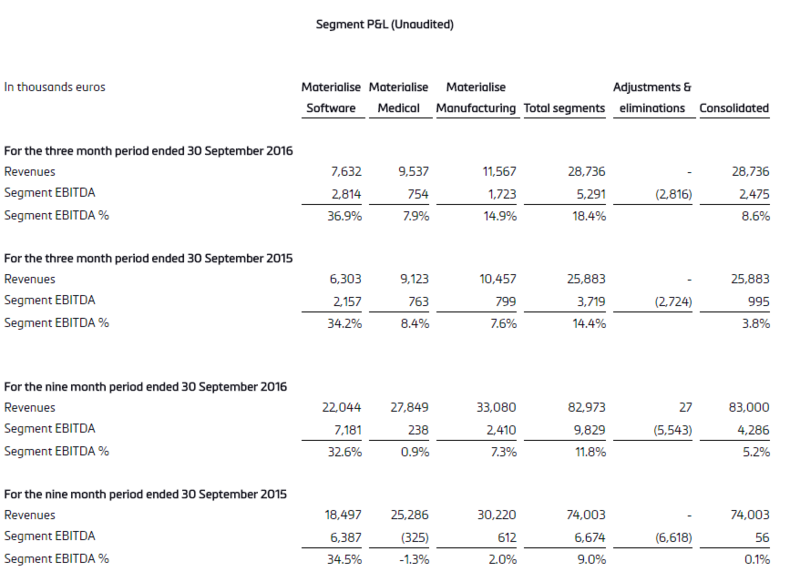 Looking at the balance sheet, Materialise hold a relatively stable amount of cash, and other assets such as trade receivables and inventory also show only marginal movement. 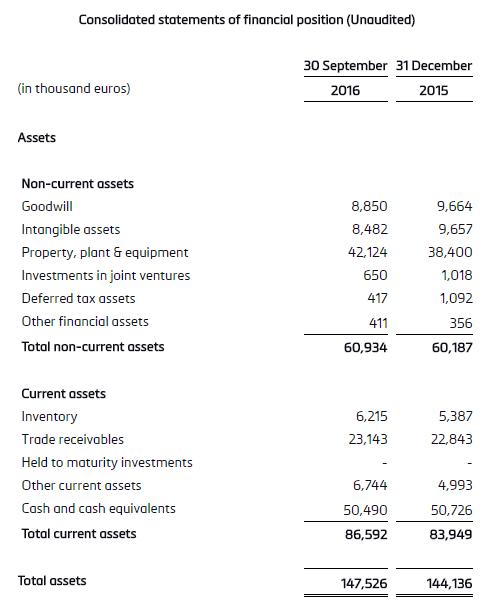 Borrowings however have increased by $5.47m (EUR 5m) compared to the year end position for 2015, this was explained on the call as related to capital investments in the Poland and Belgium facilities. The funding of these new facilitates contributed to the negative cash flow from operations of $1.64m (EUR 1.5m). 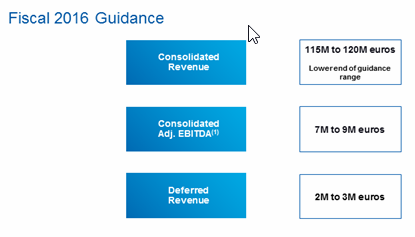 On today’s call Materialise advised that revenue will be at lower end of previous guidance, and that deferred revenue will not reach $4.38m (EUR 4m) as previously indicated. Looking to 2017 the company’s forthcoming x-ray product is unlikely to generate revenue for some time. Peter Leys said, “we’re fine tuning our x-ray knee guide for approval by the FDA” and “continuing discussions with potential partners. The ramping up of the product is more likely for end of 2017,” or possibly 2018. 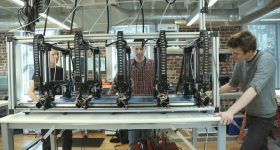 It is clear in the medical 3D printing arena while the revenue streams are quite limited, because in the end we are dealing with products that have just been launched but have relatively little revenue, it is important to have the right partnerships. We have made a few partnerships, but there are more in the pipeline. 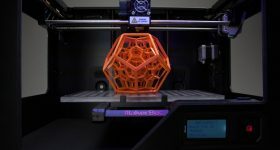 An overarching theme of today’s call was that Materialise are gearing up to take advantage of the move from prototyping to manufacturing currently underway in the 3D printing industry. This is an arena earmarked by several others in the industry and identified as a key battleground by 3D Systems: who recently promised a new aggressive approach. Peter Leys advised that looking at the strong growth seen in software would reveal that in particular the “manufacturing control platform” was making a substantial contribution to the bottom line. At Formnext the company will be announcing further expansion in this area. 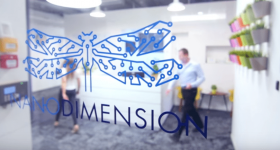 3DPI will bring you updates next week as we learn more, make sure you sign up for our newsletter to make sure you are first with the latest additive manufacturing news. Featured image is from a video announcing Peugeot Fractal car partnership with Materialise.